While most Indian banks have not gone beyond informing their customers as to the location of their ATMs in the city, and probably IPL cricket score updates, ICICI has made a bold and integrated step towards virtual financial transaction through Facebook, offering multiple features such as mobile recharge, movie ticket booking, and easy money transfers. 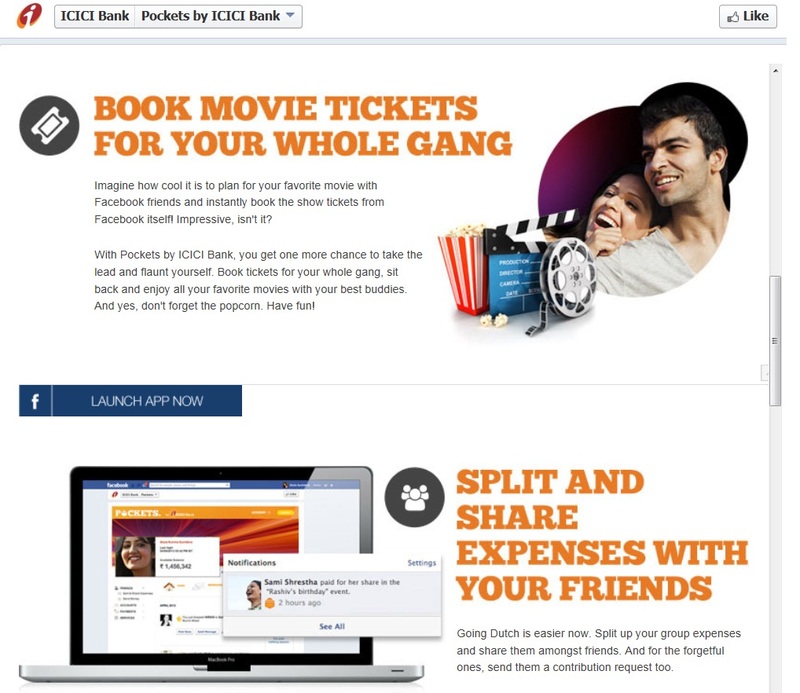 ICICI’s latest Facebook campaign, Pockets by ICICI Bank, is aimed at the young and dynamic youth facilitating financial transactions, socializing group activities and secure transfers of money. 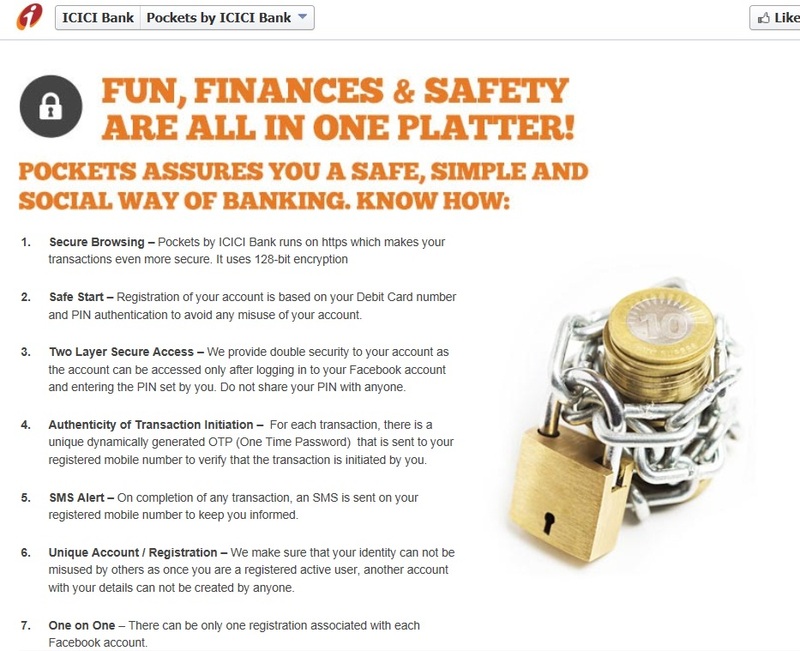 The campaign instructions clearly state that the transactions can happen between ICICI and ‘any other bank’ through its Facebook app, which appears multilateral at the first sight, but is quite user-friendly. One of its objectives is clearly to leverage its large user base and encourage them to indulge in virtual money transfers in two to three simple steps. There are three in-built applications in Pockets by ICICI Bank, which allow users to transfer money, book movie tickets and recharge mobile phones without the hassle of memorizing too many numbers and alphanumeric passwords. The first feature of the app – Split n Share – allows users to split and track group expenses and share with their friends on Facebook. The Pay a Friend feature of the app allows customers to transfer funds to their friends without having to divulge any bank account details like account number, bank branch, branch IFSC code etc. Through this facility, customers can create electronic coupons that can be redeemed by their friends on the ICICI bank’s website. Through this app, users can also recharge their mobile phones on Facebook itself. Interestingly, the app includes socializing features such as booking movie tickets for friends and family on Facebook, as well as allowing users to plan, share, and display their trips through this app. Users can invite friends to plan their favourite movies on Facebook and instantly book the tickets using the app. The app runs on https and uses 128 bit encryption which keeps customer information safe. Registration of an ICICI account is based on the customer’s debit card number and PIN authentication to avoid misuse. The one time password option on every transaction ensures verification of the customer identity. While the app assures consumers of secure transaction at almost every step, it also offers non-financial transactions to customers who can also carry out a wide range of non-financial transactions through this app. The list includes viewing a summary as well as a mini statement of their savings bank account, getting credit card details and getting demat holding statements. Through this app, a customer can open a fixed or recurring deposit, order a cheque book, stop a cheque payment and upgrade their debit card. 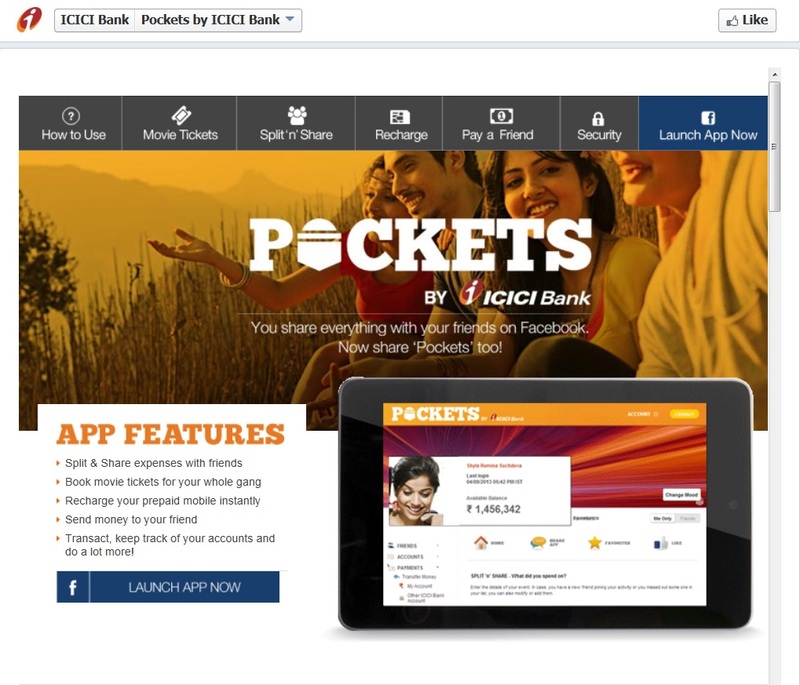 Pockets by ICICI app is a unique technological innovation by ICICI Bank. The app is convenient and user friendly. This innovation is in line with ICICI’s philosophy of ‘Khayaal Aapka’ wherein the bank offers products and services which make banking easier and more convenient for customers. It is an integrated effort by the brand to take its core message out to social media. Through the redeemable coupons strategy, the app integrates offline banking with online banking. As a whole, the campaign facilitates sensible applications, discussions, actions and transactions. The payment gateways of the app are highly secure and the guidelines clearly state that. The campaign appears to be very strong and attempts to integrate its core brand messaging with its offline strategy. Though some users could be wary of transferring large amounts of money through Facebook, the app is highly secure and is a friendly platform for transactions. Pockets by ICICI Bank is a highly innovative app which offers the right mix of consumption and socialization. Therefore its purpose is different from online and mobile money transfer. The app is clearly a youth-oriented online wallet which smartly integrates banking with social media. Unlike online banking, the app offers social activities for friends and families such as planning outings and films with friends on Facebook.